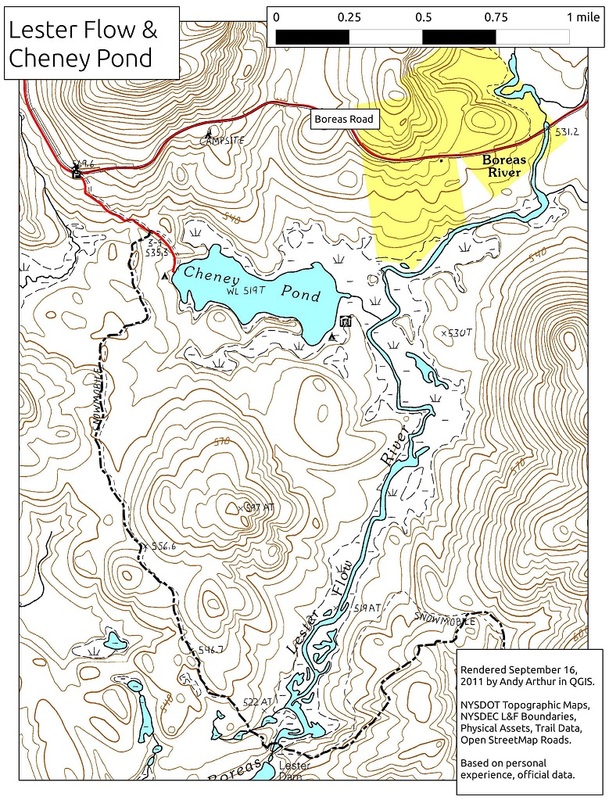 Cheney Pond is probably the easiest to reach backcountry pond that is located off Boreas Road in the Vanderwhacker Mountain Wild Forest of the central Adirondacks. A rough dirt road travels to the pond from Boreas Road that can be used as a hiking or biking trail. There is a lean to located across the pond, accessible via boat. The road is open to vehicles, however travel on the road isn't recommended unless you have a high clearance truck. The start of the road near the junction with Boreas Road looks like it is a good gravel road. Don't let this fool you as the dirt road quickly deteriorates with washouts, ruts and muddy sections. It's a really easy hike to reach the pond, so leave the vehicle up the road. The whole way to the pond is downhill with an elevation change of about 175 feet. The start of the trail is located along Boreas Road, west of the bridge over the Boreas River on the south side of the road and east of Tahawus Road. The GPS coordinates are N43 56.441 W73 59.204 for the start of the trail for those who have a GPS devise. There is a DEC sign at the intersection of the gravel road and Boreas Road. The old DEC sign stated that it is 1.0 miles to the pond (pic below). It is only 0.5 miles to reach the pond and the DEC has replaced the signage with the correct distance. There is parking along the side of the gravel road near the intersection. This is also the starting point for the hike to Lester Dam. Follow the dirt road for 0.4 miles. At this point you reach a junction. To the right is the trail to Lester Dam. To the left is Cheney Pond. You'll reach the end of the road in another 500 feet, where there is a campsite and a place to launch a small boat on the pond. There are other campsites located along the shore of the pond, accessible by boat including a lean to. This is a popular destination due to the ease to reach the pond, especially those willing to drive the rough road. 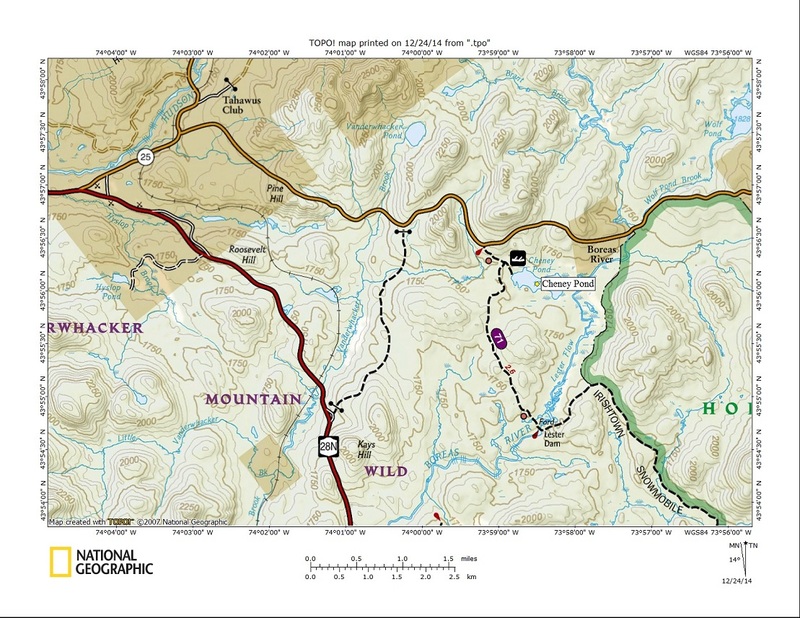 Look below for a few pictures and a couple of maps of this popular pond in the Adirondacks.